We help employees with long-term conditions and disabilities find, build and maintain great jobs. 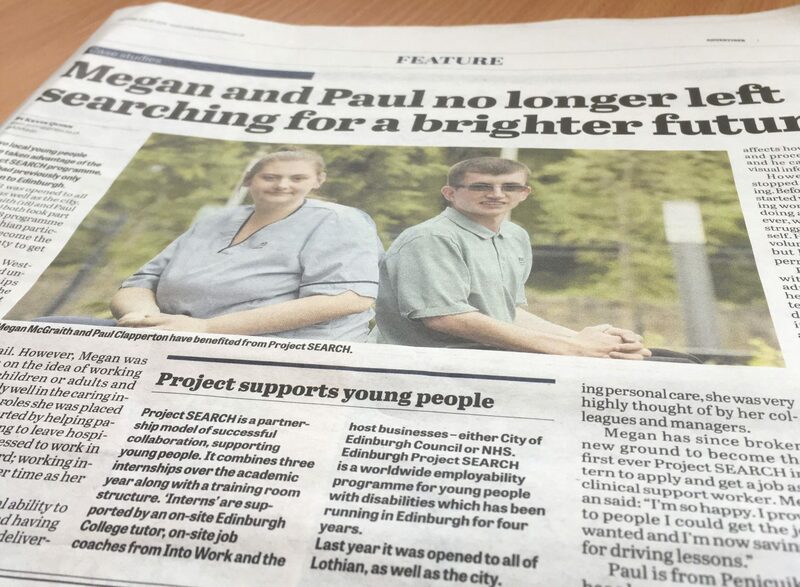 Midlothian Advertiser published an excellent article about two our our ProjectSearch interns who have successfully gained employment through the course. Two local young people have taken advantage of the Project SEARCH programme, which had previously only been open to Edinburgh. Last year it was opened to all of Lothian, as well as the city. Megan McGraith (18) and Paul Clapperton (22) both took part in the 2017 – 2018 programme as the first Midlothian participants and have become the first from the county to get paid work from it. Both were based at Western General Hospital and undertook three internships over the academic year; the idea being to try out different things each term. The goal – to be better skilled, familiar and confident enough to apply for and get a paid job when the year was up. Megan from Loanhead, was advised to go to college after school and it was thought that mainstream paid employment may not be an option for her. Megan has autism and this affects how she interprets information – she may need instructions broken down. Before Project SEARCH she gained qualifications at college which included work experience placements in retail. However, Megan was keen on the idea of working with children or adults and did really well in the caring internship roles she was placed on. She started by helping patients waiting to leave hospital and progressed to work in a specialist ward; working independently over time as her confidence grew. With her natural ability to reassure patients and having become confident in delivering personal care, she was very highly thought of by her colleagues and managers. Paul is from Penicuik and has a learning disability which affects how he understands and processes information and he can sometimes find visual information confusing. However, this has not stopped Paul from progressing. Before project SEARCH he started with temporary catering work in care homes after doing a college course. However, when this work ended he struggled to find a job by himself. He did keep busy though, volunteering in charity shops but he needed help to get a permanent job. Paul had the opportunity with Project SEARCH to try administration work, which he really wanted to do. His internships involved reception; dealing with patients and visitors as well as background admin work. He had shown in the training room that he had some IT ability on which to build experience. His subsequent internship review reports were glowing and he was actively encouraged by his NHS managers to apply when vacancies came up. Paul has recently started his career in admin – with a position in clinical oncology after interviewing for four NHS jobs in total. Into Work receives public funds through grants and contracts with additional support through the European Social Fund.